While you can't exactly sit down with your pooch and explain what's going on, experts advise introducing your pet to the idea of a new arrival. "Parents should begin preparing their pet for a new baby long before the hospital trip," says Elise Gouge of PetBehaviorConsulting.com. "A dog may feel insecure about the loss of attention, jealous of the baby, frightened and more. Preparing for this change can make all the difference." Because the nose knows, pet professionals suggest focusing on an animal's keen sense of smell to help familiarize them with a new person. "Getting the pet used to baby smells, such as diaper creams and powders, and even baby toys like mobiles and rattles can make a big difference," says Gouge. "Bring some blankets home from the hospital for a dog to smell, so that the scent is not new to them when the baby arrives," offers Dr. Keith Niesenbaum, a veterinarian with Crawford Cat and <?xml:namespace prefix = st1 ns = "urn:schemas-microsoft-com:office:smarttags" />Dog Hospital in Garden City Park, NY. And it doesn't hurt to let your pet hang out while you're assembling your baby's bouncy seat or swing. "Setting up baby gear is a great way to see how your dog will respond to these new and exciting types of equipment," says Jennifer Shryock, a certified dog behavior consultant and director of FamilyPaws.com, a national parent education program. In fact, setting up a crib or installing a baby monitor is an ideal opportunity to demonstrate how you'll be communicating with your pet�and letting him know what things are off-limits. Go ahead and let your dog or cat sniff the new items, suggests Shryock. "I don't want to add stress or tell them, 'No, stay away," she affirms. "That only increases the potential for negative associations and stress for all." Instead, set up what Shryock refers to as 'success stations,' safe areas where a dog can enjoy some quiet time or a treat. For instance, after a baby has arrived home and the family is settling in, an indoor tether stationed in the living room enables a pet to participate and observe from a safe distance while a parent feeds or holds their baby. "Parents are able to observe the dog's reaction to the baby and reward the dog with treats for calm and desirable behaviors," explains Shryock. Instances like these, in short periods throughout the day, allow a pet to become familiar with the baby. Even with the best of intentions, there are always mistakes to be made, especially when it comes to pet/baby bonding. One of the more common�and detrimental�errors in judgment is leaving a pet and child unattended. "In only seconds, an animal can cause significant injuries to a child or baby," says Gouge, stressing that children and pets should always be supervised. And even when mom or dad is in the same room as their child and pet, it's crucial to keep a watchful eye on their exchanges at all times. "This is when accidents happen," notes Shryock. "Parents must be active supervisors in order to notice the subtle signals that may communicate conflict or stress from their pet." For those parents still a bit hesitant about whether or not their pet and child will get along, experts offer their recipe for maintaining a success relationship. "It's important that you continue to give your pet attention and time with just you, so they do not feel ignored or threatened by the new arrival," recommends Niesenbaum. Gouge seconds this notion of providing breathing space for everyone involved. "The pet needs enrichment, veterinary care, exercise and affection apart," she says. 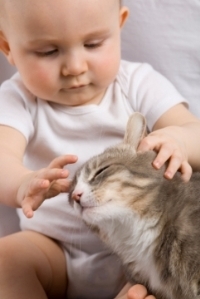 "Pets and children need time apart�so that neither one is overwhelmed or stressed. Being sensitive to these factors and planning ahead can ensure a happy environment for all."